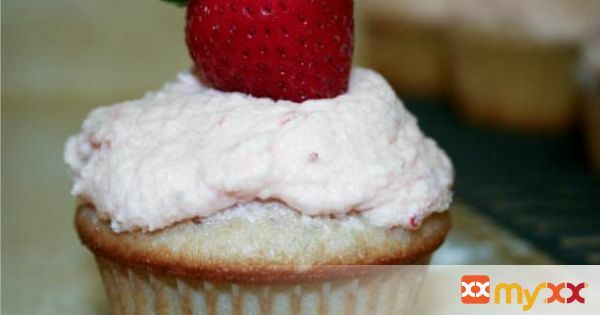 Check out this fresh strawberry cupcake recipe. Perfectly moist and crumbly, irresistible when paired with fresh strawberry buttercream. 1. Preheat the oven to 350 degrees fahrenheit and line a cupcake pan with cupcake liners. 2. Quarter the strawberries and puree until smooth. Measure 1/3 puree and set aside any extra to use for frosting. 3. Mix the 1/3 cup strawberry puree, milk and vanilla. 4. In a medium bowl whisk together the flour, baking powder, and salt. Set aside. 5. In a large bowl cream the butter until light and fluffy. Continue to mix while slowly adding the sugar. 6. Mix in the egg until just barely incorporated, then add the egg whites 1 at a time until just mixed in. 7. In a few alternating parts, starting and ending with the flour mixture, mix in the flour mixture and strawberry mixture. 8. Spoon the batter into the cupcake pans and bake 20 - 25 minutes, rotating the pans 180 degrees during baking. The cupcakes are done when a toothpick comes out clean after inserting into the middle of the cupcake. 9. Cool 5-10 minutes in the pan then cool completely on a wire rack. Once completely cool to the touch frost the cupcakes with the fresh strawberry frosting.